Does fruit-picker scheme go far enough? Government plans to allow UK fruit and vegetable growers to recruit non-EU seasonal workers after Brexit have been criticised inside the industry as insufficient. The government's proposed pilot scheme would allow the recruitment of up to 2,500 workers on six-month visas between the spring of 2019 and December 2020. The National Farmers Union (NFU) said the government's announcement was a "major victory" after two years of evidence that "a shortage of workers has been hampering food production". But British Summer Fruits - the industry body representing companies that supply fresh berries in UK supermarkets - says it's not enough. According to British Summer Fruits, farms are already reporting staff shortages of between 10% and 20%. The NFU estimates that 60,000 seasonal workers are employed in UK horticulture every year. If that's right, then 10% to 20% would imply a range of between 6,000 and 12,000 workers per year, although other estimates believe the figure is higher. What is clear is that the overwhelming majority of those workers had - in previous years - come from Central and Eastern Europe. The NFU says roughly 67% have come from Romania and Bulgaria, 23% from eight other Central and Eastern European countries in the EU, and just 1% from the UK itself. Fewer seasonal workers have been coming to the UK from Central and Eastern Europe since the Brexit referendum, partly because of the decline in the value of the pound, which makes the amount paid to EU workers worth less when they return home and convert it into euros. It is also partly because other EU countries such as Germany are making greater efforts to attract seasonal workers. There is also the argument - which is more difficult to quantify - that EU workers feel less welcome than they did before. Whatever the precise reasons, the vast majority of fruit growers are worried that shortages of seasonal workers are going to get worse. There has already been an impact. In 2017, the NFU says, wages increased by an average of 9% compared with 2016. But the shortages were still there and there was no sign of more local workers signing up for the work. What do these labour shortages mean for fruit picking around the country? There has been plenty of anecdotal information about fruit left rotting in the fields - but it's hard to get any overall figures for the amount of fruit that may have been left on the plants across the UK. There are some clues out there, though. Angus Growers - based in Arbroath on the east coast of Scotland - says it was unable to pick 83.5 tonnes of soft fruit with an estimated value of £416,000 last year, because of a shortage of labour. Overall, it says, the total shortage of work days (the number of people multiplied by the number of days work missed) was 7,944. 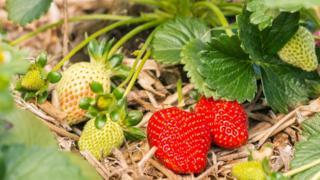 British Summer Fruits estimates that Angus Growers represents about 10% of the UK berry production. It is only one example but other companies tell similar stories. And the concern is that future growth in the sector is under threat. The government's proposed pilot scheme represents "a 4% increase in a shrinking workforce", says Nick Marston, chairman of British Summer Fruits. "The UK berry industry grows by at least 8% per annum and this [the government's plan] will not sustain a standstill, let alone growth." Figures from the Department for Environment, Food and Rural Affairs suggest those fears have not yet been realised. They say there was production of £541m of soft fruit in 2017, up from £495m in 2016. In the same period, orchard fruit rose from £205m to £224m. But labour shortages are certainly beginning to bite. The last time the UK had a seasonal agricultural worker scheme in 2013, 21,250 workers were allowed into the UK from Bulgaria and Romania before they gained full EU rights to freedom of movement. And many people in the industry believe similar numbers will be needed in the future. The government has suggested that it is willing to listen. "We will review the pilot's results," said the Environment Secretary Michael Gove, "as we look at how best to support the longer-term needs of industry outside the EU."